Neoptix T1™ optical temperature sensor is specifically designed for general use in laboratories, industrial and cryogenic applications. It features complete immunity to microwaves and RF (EMI/RFI), high voltage and harsh environments. It has a high resistance to a wide range of temperature and meets all requirements for long term survivability to chemicals and solvents. Also, Neoptix optical temperature sensors are intrinsically safe and are perfectly adapted to temperature measurement in critical or explosive areas. As all Neoptix probes, the «T1» does not require any recalibration or complex «gage factor» input to operate. The small optical fiber diameter allows very sharp bending radius. The standard probe has a response time of less than 500 milliseconds. A faster version is available with a response time of 35 milliseconds. The size of the sensitive area is 300 microns in diameter. The outer protective jacket is made out of pure virgin PTFE Teflon™ and has a diameter of 1.15 millimeters. It has a standard length of 2 meters and features a ST connector. 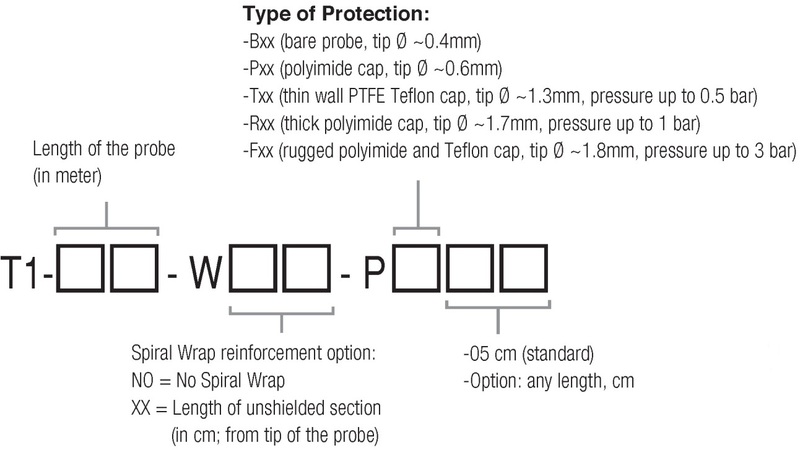 The T1 can be ordered with a MW/RF immune dielectric connector made out of Ultem material. The operating temperature range from minus 270 to 250 Degrees Celcius (-455 to 482 ºF ). Optionally, this sensor can be ordered with a temperature range as low as 2 Kelvin. Its uncalibrated accuracy is ±0.8 ºC. The T1 probe can also be used in a high vacuum environment. Neoptix T1™ optical temperature sensor is designed to perfectly mate with our complete line of signal conditioners including the Nomad handheld, the Reflex™ and the Omniflex™. The sensor is delivered with a NIST traceable Calibration Certificate. Supplementary plastic box to store your T1 fiber optic temperature probe.